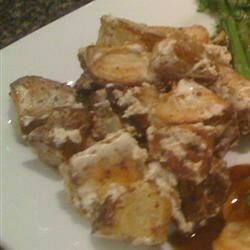 "This is a very simple and easy potato side dish. A simple yogurt dressing adorns this intriguing hot salad. It goes well with BBQ'd meat." In a medium bowl, toss potatoes with olive oil to coat, and place in a shallow roasting pan or baking dish. Season with salt and pepper. Bake for 1 hour, or until golden brown and tender. Remove from the oven, and transfer potatoes to a large bowl. Stir in yogurt and mayonnaise to coat. Serve immediately. absolutely one of the best potatoe dishes i have ever tried. it takes the place of a cold potatoe salad with less work. don't assemble too far ahead as it tends to dry out. These were a hit at our party! There was extra sauce left. I put some chives in and garlic powder as well.